I am an abstract, mixed-media artist based in Los Angeles, CA. My art journey begins with childhood memories of spending hours immersed in art-making: cutting up paper, painting, and industriously creating sculptures with tape, glue, and watercolors. I come from a family of artists and theologians, which spurred my visual and spiritual imagination. Spending six years of my early childhood in London, while hearing stories of my parents’ years living in Puerto Rico, further sparked my interest in exploring the world for myself. While I never fully left art aside, my wanderlust and interest in community work took a primary seat in life for many years. I lived in the Patagonia of Argentina, studied abroad in Egypt, and taught at a cultural center in Nicaragua for two years. Eventually, a curiosity to pursue the intersection between theology and art led me to attend seminary in Pasadena, CA. After years of being on the move, it was during my graduate studies that I rediscovered my need to create art and claim my identity as an artist. Making art is a visual means of integrating the various landscapes, people, and ideas that form the texture of my life. I began creating my sculptural paintings almost by accident. During an exploration of textiles as a metaphor for interconnectedness and Dr. King’s concept of the “Beloved Community,” I began sewing strips of watercolor paper together. Next, I experimented with gluing the pieces together, creating three-dimensional works. These developed into topographical landscapes, echoing both the wild of the ocean and expanse of the desert. Like the landscape of my life, these are variegated and moving. The act of creating these sculptural paintings keeps me rooted in place, in materiality, and in the present moment. In all of my artwork, I strive for a sense of movement and an invitation to reflect on the concept of connection. 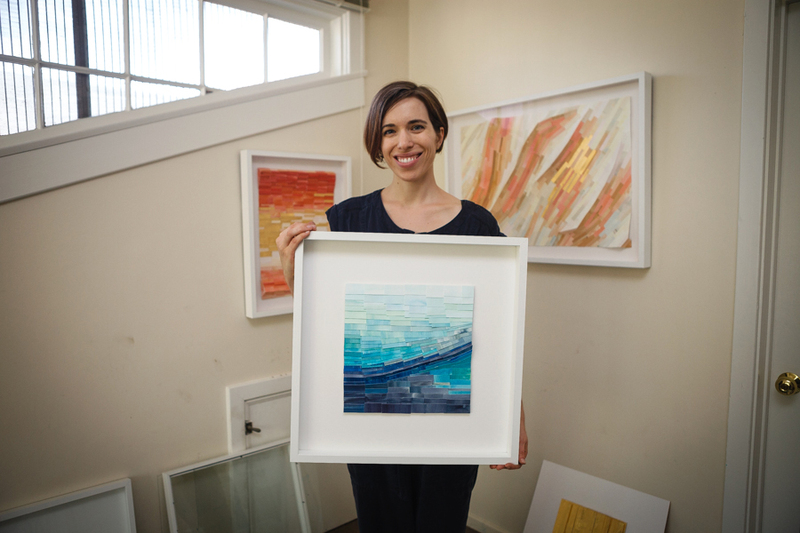 I create abstract, contemporary 2D and 3D works with paper, which reflect on themes of integration, spirituality, and movement across boundaries. While exhibiting at shows and galleries, I also sell my artworks here on my website, through art consultants, local stores, and create custom commissioned work for clients. My aim is that my artwork be a place of visual refuge in the landscapes of homes and public spaces. Join my list to become part of my artistic community, with first access to new work!